Imagine having the skills to make something with the level of workmanship and finish as the Grosvenor drinks cabinet from The Edward Barnsley Workshop. It must be immensely satisfying to take the best raw materials and fashion them by hand into something so handsome and durable. I feel an existential crisis coming on. Th drinks cabinet was designed by James Ryan, manager designer at the Barnsley Workshop. The cabinet stands at 6 feet. The doors are made in Macassar ebony, which open to reveal an illuminated interior finished in rippled sycamore. There is a shelf that slides forward to provide a work surface for mixing your drink and whatnot, and below it is a drawer dovetailed together in the traditional hand-cut Barnsley Workshop way. There is storage space for wines, spirits and glasses. The cabinet was sold to a very happy customer, but the Barnsley Workshop are open to discussing the creation of something similar should you wish it. The Edward Barnsley Workshop makes free-standing furniture mostly for the private domestic market. Edward Barnsley established his workshop in 1923 in what is now a listed building. The workshop is set in beautiful surroundings near Petersfield in Hampshire, high on a ridge overlooking beech and yew woods with magnificent views towards the South Downs. The Workshop is open by appointment to visitors who can see the craftsmen at work and view completed furniture in the showroom. 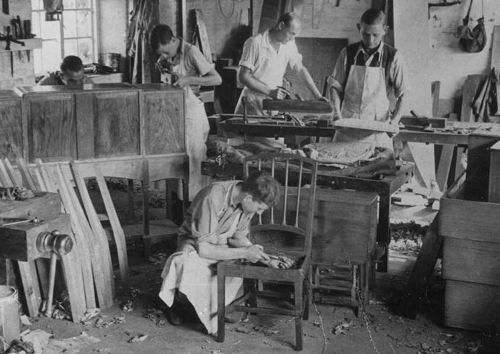 As well as producing fine furniture, the Barnsley Workshop runs a renowned training programme for budding cabinet-makers. Excellent. As well as more appreciation for makers in the UK, we also need more makers.